Who doesn’t like to be wired? These companies provide among the fastest options for Internet but boy do they charge a premium for those services. For many of you, these companies are the only game in town for high-speed Internet, TV and Phone delivered in bundled packages you never wanted (but hey that 6-month promotion at $79.99 was just too enticing). They own many of the channels you watch on your TV and browse through the interwebs. This group of companies makes the Robber Barons of the 19th century look like amateur hoarders. 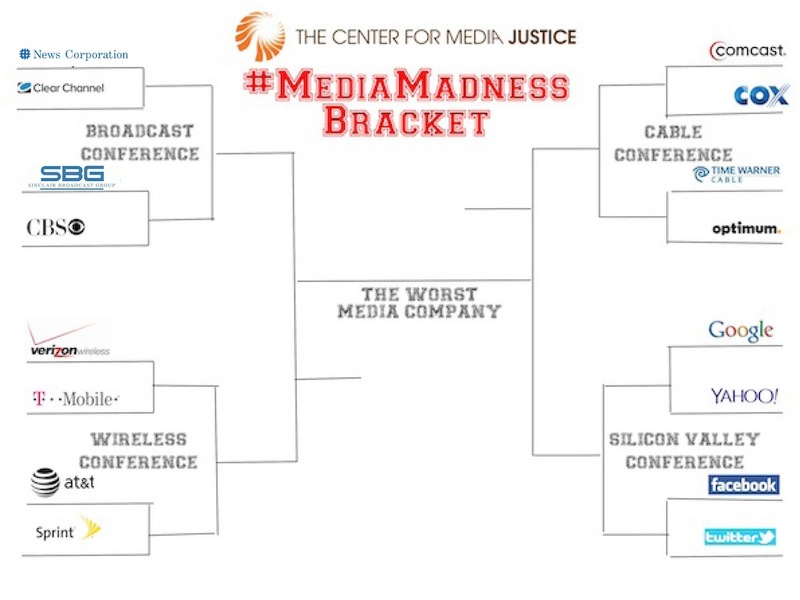 These corporations never go head to head (that’s why they get away with charging you $80 for your internet connection) so this #MediaMadness bracket is a real treat. Apparently Cox Communications didn’t get the memo on what it means to be a cable company in the #MediaMadness Tournament. First of all, why are they supporting efforts to provide health coverage for people who are uninsured? Second of all, who told them to offer up free access to over 600 episodes for their customers (that sounds pretty sweet though.) Do they think they’re competing in the Media Kindness tournament? 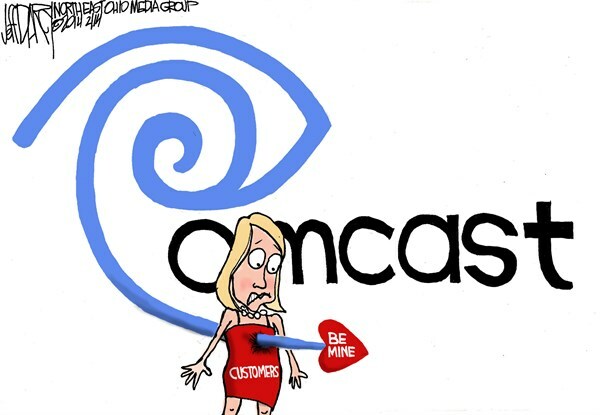 Now Comcast, there’s a cable company that knows how to mettle in issues that have nothing to do with them. From blocking laws guaranteeing paid sick days to determining our children’s education all while not paying any taxes. And they know a little something about creating special offers so riddled with loopholes that make a $10/month Internet service feel like a rip-off. To paraphrase True Detectives, Comcast is the Michael Jordan of screwing you over on your cable bill. Aside from my own personal gripes, Time Warner is the bigger player in the #MediaMadness world. Like Comcast they’ve gotten in the business of writing legislation banning local communities from building their own broadband networks. And in places like North Carolina, where such a bill was passed, some communities have been abandoned with no option for high speed Internet because Time Warner won’t build out to them and cities and counties are banned from building their own networks. 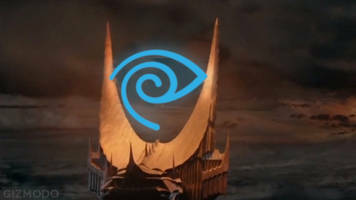 The evil Sauron, I mean Time Warner moves on to the final round! Here’s the breakdown. These two companies are among the least popular Internet Service Providers. They also happen to be the two largest cable companies with a combined footprint that covers close to 70% of the United States. Both are active in the American Legislative Exchange Council (ALEC), a conservative think tank which has been proposing and passing deregulation bills across the country to strip local and state agencies from any oversight of cable companies and banned cities from building their own broadband networks. And if all of that wasn’t bad enough, now these two have announced a plan to merge. So evenly and evil-ly matched. Who pulls through to the #MediaMadness Final Four? Com-Warner Cable moves on to the next round! In a strange twist of events, these two decided they have $45.2 billion reasons to proceed to the Final Four together! So there you have it, one cable company to rule them all….